Employees need feedback more frequently than the annual performance review. Transform the performance management process from a once-a-year event to real-time feedback resulting in higher engagement and a culture of recognition. 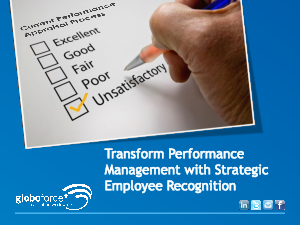 With Strategic Recognition ™ you can easily integrate feedback into the daily work practices of managers and employees. Give managers more tools for frequent, timely, appropriate feedback. Motivate employees with recognition of values-based performance. Unlock employee engagement for increased shareholder return.